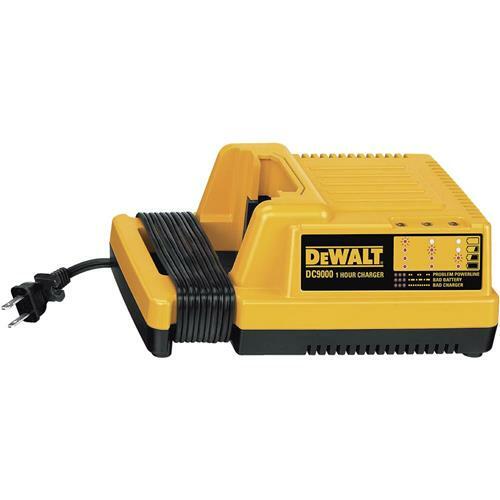 Stay charged up and ready to work with DEWALT’s DC9000 one-hour battery charger. This state-of-the-art electronic device provides a fast, reliable way to recharge 36-volt lithium-ion battery packs. It features DEWALT’s exclusive three-stage charging system that ensures maximum run-time, but also extends the overall life of the battery. As a result, you work faster and longer with less downtime, and get the maximum amount of power from these high-performance batteries. The DC9000 has a cord wrap for easy storage, and a convenient gauge that shows how much charge remains in a battery. It’s compatible with 28- to 36-volt batteries, and is backed by DEWALT’s three-year limited warranty, 90-day money-back guarantee, and one-year free service contract. 1 hour charging provides fast charging for minimum downtime. Battery gauge indicates how much charge is in the battery. Cord wrap provides improved cord storage. Note: due to the high incident of fraudulent transactions with orders containing power tools, orders for this item must ship to the billing address.